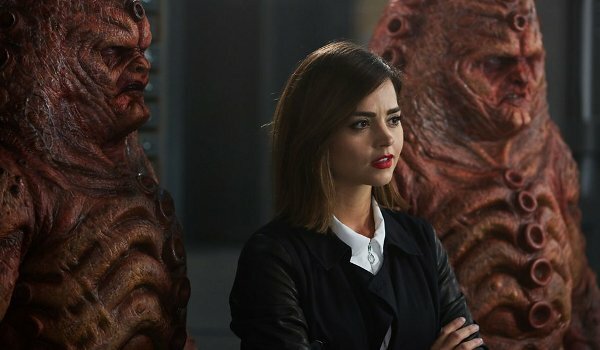 Following the recent pattern of the show's Ninth Season, Doctor Who delivers another two-part episode with "The Zygon Invasion" and "The Zygon Inversion" which pick up a plot thread of from "The Day of The Doctor" involving one of The Doctor's (Peter Capaldi) older enemies who were allowed to stay on Earth. The fragile ceasefire between humans and Zygons is broken with a splinter group of the aliens decides they are tired of hiding in human form around the world and would prefer all-out war to the surrender of their natural state. Reminiscent of "The Sontaran Stratagem" and "The Poison Sky" from Season Three, the episodes include a subplot with The Doctor's companion being replaced by a clone (or here a Zygon). Jenna Coleman does double duty here both as Clara (who spends most of the two episodes stuck inside a Zygon pod) and as the leader of the Zygon rebellion who at one point tries to kill The Doctor with a surface-to-air missile. The episodes also bring back Ingrid Oliver as Osgood, a character who would make an interesting companion if she wasn't dedicated to keeping the peace between human and Zygon. Because of the multi-part episodes and Capaldi's speech in the final act involving a pair of doomsday boxes, The "Zygon Invasion" and "The Zygon Inversion" feel very much like old Tom Baker episodes from the classic series. With an impassion plea and a lie, The Doctor is able to restore the fragile peace largely thanks to the mind and heart of Clara Owsald. The Zygon leader who imprinted on her finds the companion impossible to argue with. Continuing to foreshadow Clara's departure, the TARDIS is certainly going to feel like more empty where Coleman leaves the series.